6. Present reading as an activity with a purpose—a way to gather useful information for, say, making paper airplanes, identifying a doll or stamp in your child's collection, or planning a family trip. 10. Set aside a regular time for reading in your family, independent of schoolwork—the 20 minutes before lights out, just after dinner, or whatever fits into your household schedule. As little as 10 minutes of free reading a day can help improve your child's skills and habits. 19. Limit your children's television viewing in an effort to make time for other activities, such as reading. But never use TV as a reward for reading, or a punishment for not reading. The 2014 Governor’s Summer Reading Challenge. Book that feature in the suggested reading list for the Governor's Reading Challenge are currently on display at the Derby Public Library. But remember - you can choose any book you want to read! Just don't forget to record the book titles you read in your journal here and hand them into school when you go back to school. Students who read over the summer do better in school in the fall. Students who do not read over the summer demonstrate academic loss in fall. 8 out of 10 studies indicate students who read for fun out-performed those who did not. Students read more when they can choose their own books. Reading 5 books over the summer can prevent academic loss. Summer reading loss is cumulative. 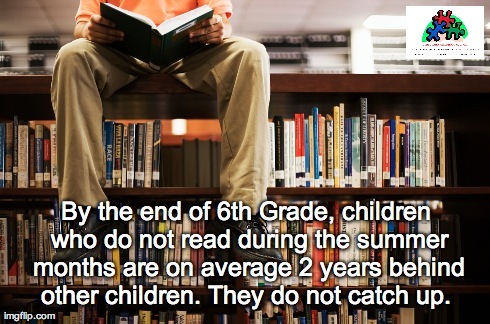 By the end of 6th grade, children who do not read over the summer are two years behind other children. Stress the importance of summer reading with your child. Make reading exciting; don’t think of it as a chore. Create a no TV or electronic game time during part of each day. Join a summer reading program at your local library. Let your child choose his/her own books. Keep a supply of reading materials around the house. Go to the library regularly. Ask your child questions about the books s/he is reading.